All our Products are Guaranteed. S hop By Ring Size. HIGH QUALITY SUPER SHINY FINISH. MADE IN ITALY SOLID STERLING SILVER NECKLACE! WE CAN SUPPLY AS MANY QUANTITY AS YOU NEED. MORE SIZES AND LENGTHS AVAILABLE INQUIRE FOR MORE INFORMATION. MARINER 16 040-1.5MM 1.7GM. MARINER 18 040-1.5MM 1.9GM. MARINER 20 040-1.5MM 2.1GM. MARINER 22 040-1.5MM 2.4GM. MARINER 16 050-2MM 2.3GM. MARINER 18 050-2MM 2.7GM. MARINER 20 050-2MM 3.2GM. MARINER 22 050-2MM 3.4GM. MARINER 24 050-2MM 3.6GM. MARINER 16 080-3MM 6.7GM. MARINER 18 080-3MM 7.9GM. MARINER 20 080-3MM 8.6GM. MARINER 22 080-3MM 9.2GM. MARINER 24 080-3MM 10.5GM. MARINER 30 080-3MM 12.3GM. MARINER 16 100-4MM 10.8GM. MARINER 18 100-4MM 12.0GM. MARINER 20 100-4MM 12.5GM. MARINER 22 100-4MM 13.6GM. MARINER 24 100-4MM 14.9GM. MARINER 30 100-4MM 18.7GM. MARINER 16 120-5MM 12.9GM. MARINER 18 120-5MM 15.2GM. MARINER 22 120-5MM 19.4GM. MARINER 20 150-6MM 20.5GM. MARINER 24 150-6MM 27.5GM. MARINER 30 150-6MM 32.0GM. MARINER 26 180-7MM 52.0GM. MARINER 30 180-7MM 64.0GM. MARINER 20 220-9MM 36.4GM. MARINER 30 220-9MM 54.6GM. MARINER LINK Chain Made in Italy Nickel Free SOLID. 1.5mm, 2mm, 3mm, 4mm, 5mm, 6mm, 7mm, 8MM. Varies please see chart Grams (weight measurements include silver and gemstone). Failure to do so may cause our automated dispute system to file disputes for unpaid items. How do I combine my items? You will not find a better price anywhere for these quality pieces. International Orders take from 10-20 days depending on the country. Do you offer free ring resizing? Sorry, we do not resize or customize the items we have for sale. You may consult with your Local Jeweler, some rings can be sized but due to the nature of silver, the ring may become damaged from sizing. Do you have another of the same item? Each of our Jewelry pieces is unique, but sometimes we have similar rings or items in different sizes. Yes, all our stones are real and natural. Is all your jewelry 925 silver? Yes, all our jewelry is guaranteed 925 silver. Is the pictured item the exact one I will receive? Yes, you will receive the exact item pictured. We are always available to answer any questions or concerns you may have! We take great pride in providing you accurate, correctly described and products. Thank you for shopping at Oxford Diamond Co! The item "Mariner LINK Chain SOLID. 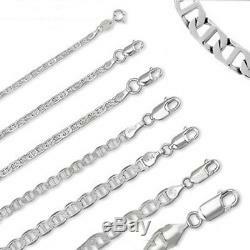 925 STERLING SILVER Made in Italy Nickel Free" is in sale since Monday, February 11, 2013. This item is in the category "Jewelry & Watches\Fashion Jewelry\Necklaces & Pendants". The seller is "oxforddiamondco" and is located in Los Angeles, California. This item can be shipped worldwide.